In Telephones > Show & Tell. By 1951, operators in large metropolitan areas of the U.S. were mostly putting through long distance calls or helping people at payphones or with service problems. 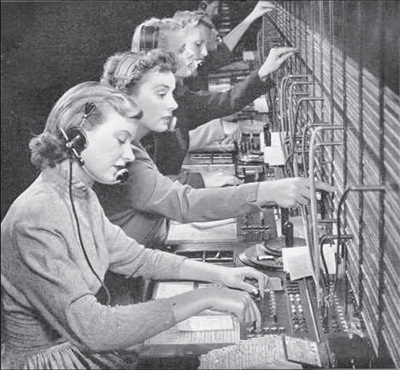 Direct dial service (phones with dials) had been in place in many metro areas since the 1920s, but telephone company operator was still viewed as a secure job (voice recognition and the Internet really didn't change that until the 1990s). The Chesapeake and Potomac Telephone Company has always been one of my favorites of the old Bells, probably just because I like the sound of the name. It sure sounds better than the companies that acquired it - Bell Atlantic, and now Verizon. This photo reminds me of a movie I saw not long ago starring Angelina Jolie.She was a supervisor on the line and ran around on roller skates,what a fun way to spend your work day. Because that is what C&P was! A word from the central office frameman, that helped install the #5 crossbar installation in Lewisburg, W.Va. I had signed all of the documents placed in front of me, and found out later, that I had joined the union. Biggest mistake of my life, but the best lesson. A few months later, AT&T workers went on strike, forcing us to do so as well. This influence totally changed my life. After two weeks of carrying a picket sign in Oct. 1957, I quit, and told them what they could do with their job. Since then, I have traveled to 146 different countries, as management, and even President & CEO of companies. I learned early in life, that individuals don't need unions to represent them, those days have been long gone. It is that mentality that is destroying this country today. Up until now, it has been totally acceptable to stand up and speak for yourself. You will gain respect for doing so. Versus, depending on some union rep. to do it for you.